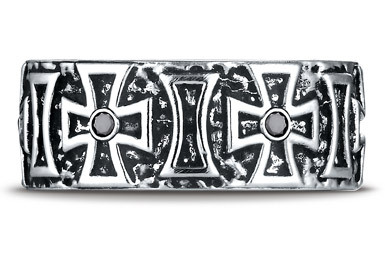 This uniquely crafted Cobaltchrome+ 9mm comfort-fit band features a Maltese cross design with six round ideal-cut black diamonds with a total diamond carat weigh of 0.12 carats. Band is burnished for a rough, antiqued finish. Cobalt is a hard, resilient, hypoallergenic metal with a perpetual high-luster that is 4x stronger than platinum, 5x stronger than gold, and 7x stronger than silver. Because of this tremendous abundance of strength, it is shatter-proof and also scratch-resistant. *Ring is available only in sizes shown. Ring is eligible for return only. We guarantee our Cobalt Maltese Black Diamond Cross Ring to be high quality, authentic jewelry, as described above.